Size of this preview: 800 × 554 pixels. Other resolutions: 320 × 221 pixels | 640 × 443 pixels | 1,024 × 709 pixels | 1,280 × 886 pixels | 5,000 × 3,460 pixels. This image was selected as picture of the day on the English Wikipedia for March 6, 2015. العربية: مسجد قِبَّة الصخرة، أحد أقسام المسجد الأقصى الواقع في القدس القديمة. أُضيفت البلاطات المصقولة الباقية حاليًّا خلال أعمال ترميم المسجد التي أمر بها السُلطان العُثماني سُليمان القانوني والذي أرسل من الآستانة أبرز وأهمّ العُمَّال والحرفيين في صناعة البلاط والقيشاني في سبيل هذه الغاية. تولّى قيادة هذه المجموعة عبدُ الله التبريزي الذي نقش على أعلى البلاطات تاريخ 952 هـ/ 1545-6م كما نقش فوق الرواق الشمالي تاريخ 959 هـ 1551-2م. استعمل عُمَّالُ البلاط طائفةً واسعة من التقنيَّات، بما فيها قطعه، وصقله، ومزججته. أنظر: Atasoy, Nurhan; Raby, Julian (1989), Iznik: The Pottery of Ottoman Turkey, London: Alexandra Press, ISBN 978-1-85669-054-6, p. 220. نسختان مُتوفرتان من هذه الصورة : العاديَّة (اللازائفة) وأخرى زائفة. English: Dome of the Rock (Arabic: مسجد قبة الصخرة‎, Hebrew: כיפת הסלע), (NE facade, panel detail with ceramic tiles on the Temple Mount in the Old City of Jerusalem. 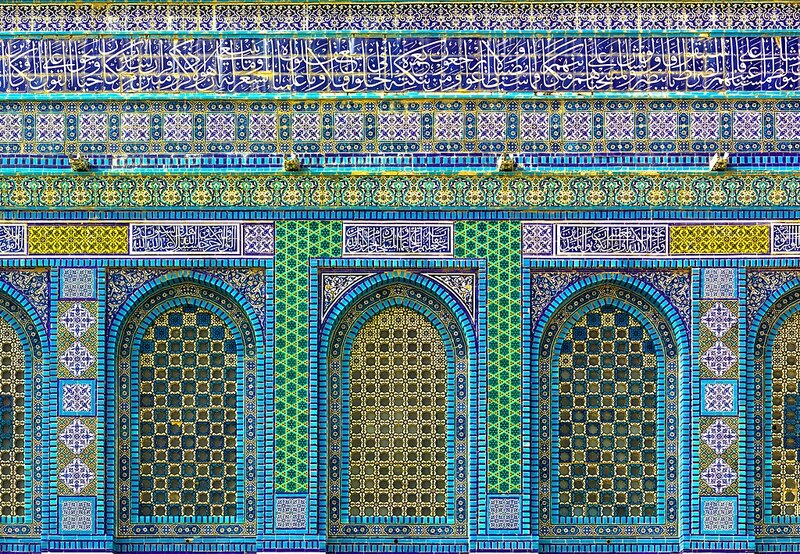 The tiles were added as part of the redecoration of the building ordered by Sultan Suleyman who sent a group of tile-makers from Istanbul to Jerusalem. They were led by Abdullah Tabrizi who signed the cut-tile inscription at the top of the drum with the date 952 AH/AD 1545-6 and the inscription above the north porch with the date 959 AH/AD 1551-2. The tile-makers used a range of techniques, including cut-tile work, cuerda seca, and under-glaze. See: Atasoy, Nurhan; Raby, Julian (1989), Iznik: The Pottery of Ottoman Turkey, London: Alexandra Press, ISBN 978-1-85669-054-6, p. 220. Two versions exist of this image: Regular (Non pseudo-HDR) and a pseudo-HDR. Français : Décor extérieur en carreaux de céramique du dôme du Rocher, à Jérusalem. Deutsch: Teilansicht Felsendom in Jerusalem: Keramikfliesen aus der Nord-Ost-Fassade. Polski: Płytki ceramiczne dodane pod rządami Sulejmana Wspaniałego w Kopule na Skale w Jerozolimie. Elewacja północno-wschodnia. This file does not link to the relevant nomination page! Please refer to Template:Assessments/doc! This is a featured picture on Wikimedia Commons (Featured pictures) and is [[|considered]] one of the finest images. This image has been assessed under the valued image criteria and is considered the most valued image on Commons within the scope . This is a featured picture on the Arabic language Wikipedia (صور مختارة) and is considered one of the finest images. This is a featured picture on the Azerbaijani language Wikipedia (Seçilmiş şəkillər) and is considered one of the finest images. This is a featured picture on the Spanish language Wikipedia (Recursos destacados) and is considered one of the finest images. This is a featured picture on the Hebrew language Wikipedia (תמונות מומלצות) and is considered one of the finest images. This is a featured picture on the Japanese language Wikipedia (秀逸な画像) and is considered one of the finest images. This is a featured picture on the Polish language Wikipedia (Ilustracja na medal) and is considered one of the finest images. This is a featured picture on the Romanian language Wikipedia (Imagini de calitate) and is considered one of the finest images. This is a featured picture on the Thai language Wikipedia (ภาพคัดสรร) and is considered one of the finest images. The copyright holder of this file, Andrew Shiva, allows anyone to use it for any purpose, provided that the copyright holder is properly attributed. Redistribution, derivative work, commercial use, and all other use is permitted. Attribution: Use or reproduction of this image outside of Wikipedia must give the original photographer (Andrew Shiva) credit. Although not required, it would be appreciated if a message was left here indicating where this image was being used. current 22:08, 29 December 2013 5,000 × 3,460 (25.78 MB) Godot13 Reverted to version as of 13:16, 13 May 2013 The image has passed 9 different FP processes. To change it now would quastion the validity of the version that has been approved.